In 2006, I discovered from my own experience that the best time to eat is within the first eight waking hours of the day and that it’s best not to eat at all during the remaining sixteen. The anti-aging results were so impressive I felt compelled to write what’s been my most popular book to date – Quantum Eating. 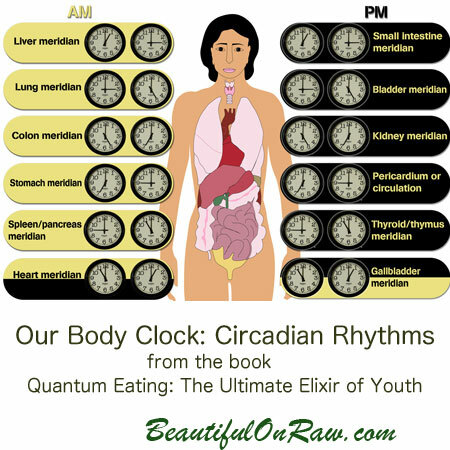 I found support for my Quantum Eating practice in ancient eastern teachings surrounding the concept of “meridians.” Every meridian, says this theory, along with the organs it passes through, has its own natural two-hour window of highest activity. Now science offers more confirmation than ever for the optimum time-frame concept. “Eating by the Clock”, a September, 2013 article in The Scientist magazine, quotes a new study of several hundred dieters (by Frank Scheer of Harvard Med and Marta Garaulet of Murcia University) which contrasted dieters who finished eating their main meal by 3:00 pm each day with those who ate it later—similar diets, similar exercise programs, similar sleep patterns, and the like. The result? Early eaters lost more weight and more quickly. The Scientist says these findings “add to the growing recognition that our metabolisms are primed by the circadian machinery written in our genes, and that discord between the two can wreak havoc on our systems.” Or, as the Salk Institute’s Satchidananda Panda puts it, “we are very different animals between the day and night.” I mentioned as such in 2007 when the first edition of Quantum Eating came out, and introduced the idea of not eating after your afternoon meal. By now, the notion that the body has an internal “clock” is familiar enough. In fact, it has several clocks, each tuned in different ways to daily (and sometimes longer) cycles. Many of body's tissues contain such clocks. What’s more, it increasingly appears they’re not gross functions, but programmed at a much smaller level. They’re genetic in character. Bowel motility, absorption and various organs and systems throughout your body, we’re discovering, are programmed in this way. Once upon a time, it was easier for humans to stick with their natural daily rhythms. Night was the time for sleeping and huddling in groups, daytime for hunting, gathering, and eating. In the modern West, however, we’re working literally “all hours of the day and night,” eating when convenience or our jobs say we can. We’re staying up for Letterman, Conan, and the midnight zombie movie, munching on popcorn, and McDonalds is ready to offer you a burger at any time of the night. The results include weight gain on a massive scale, huge increases in diabetes rates, and all manner of metabolic disorders. Science hasn’t connected all the dots yet and won’t for a while. But the writing is on the wall. Science is finally catching up with eastern medicine but still cautious about giving direct recommendations for when we should eat, saying “more research is needed.” Meanwhile, there’s you. And while you wait for science to finish its experiments, you want to be healthy. So you are the one who must decide not only what but also when you are going to eat. I made my choice in 2005. I came to Quantum Eating six years into my all-raw lifestyle. Back then, I thought of Quantum Eating as being an “advanced” program and in the first edition of my book, I presented it as such. Is Quantum Eating only for the “advanced”? 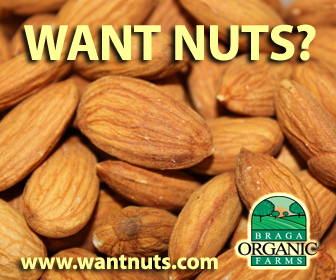 Only for those who’ve been truly raw a good long time? Not at all. As the scientific research in The Scientistdemonstrated, even those not modifying their diet at all but simply timing their meals as recommended by the Quantum Eating program can gain measurable benefits. Most of what I talk about in this 450-page volume will give you results even if you aren’t 100% raw. Most of the anti-aging practices I describe there can used equally by novices and advanced practitioners. No matter where you are in your health journey, you need to know the facts, the benefits, of Quantum Eating. They might save you years of trial and error. So, science has confirmed that not eating at night will make you lose weight. What the article doesn't mention, but what I believe is important to point out, is that the dieter who eats according to the body's natural rhythms stops losing pounds once the ideal weight is reached. What about those who don't want to lose weight, in fact they want to gain some? 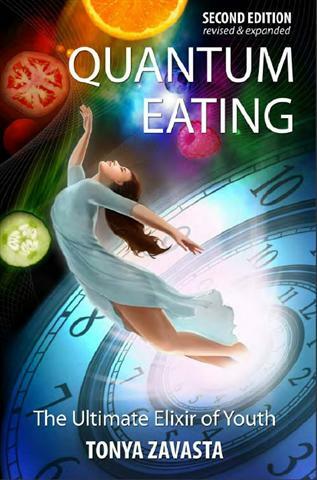 Is Quantum Eating for you? Yes, and here is why. Quantum Eating is not just about weight – it’s about achieving optimal health, which of course includes achieving your ideal weight. See this article for more info: Gaining and Losing Weight the Quantum Way. This is the link to "Eating by the Clock" from The Scientist which discusses the findings of the study. How to Survive Your First Hot Yoga Class: My Initiation, And Yours!